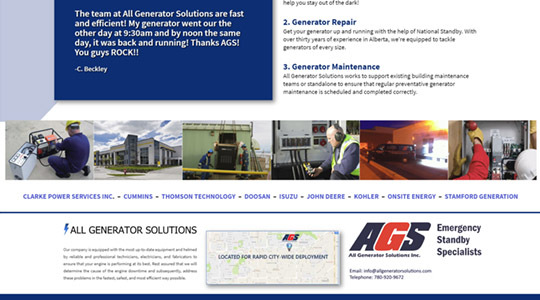 Specializing in power generator repair and not web design, the technicians at All Generator solutions chose to rely on the expertise of our team to revise their existing content management system and web presence to something more eye-catching and visually memorable while emphasizing the brand identity design. We developed a WordPress CMS to facilitate easier and more frequent updates by AGS staff members as required, and as their requirements grow. Our designers crafted a solid-looking web layout, meshing metal with electricity and consistent information flow to produce a website that delivers understandable service information quickly and displays beautifully on devices. 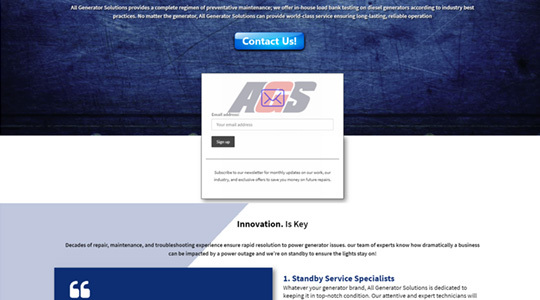 AGS also took advantage of our flexible service plans to ensure their site content is updated on a consistent basis which in turn improves search engine optimization and keeps search engines like Google interested. 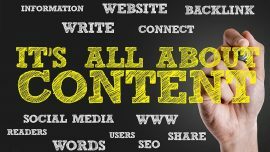 Adding tons of content can be important in terms of how information a website design is, and how search-relevant it is, but it can also lead to a cumbersome user experience. Often, it’s more important to get website visitors through an immediate, brief and very clear understanding of the message or mission, and on to picking up the phone. 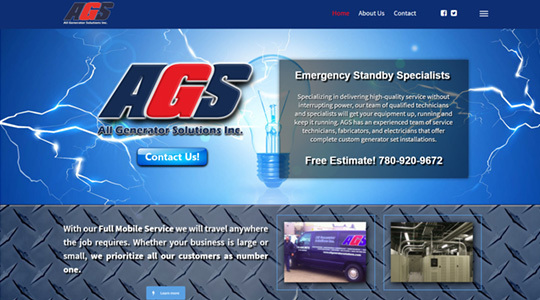 In the case of All Generator Solutions website design, we know that if a businesses with a power situation is calling an emergency standby specialist like AGS, then they don’t have time to waste. They need to know that they are calling the right business for the job, and how to get in touch with that business as quickly as possible. Concise first-impression informational content, up-front contact numbers, all wrapped in attractive branding accents… it all makes for a beautiful and memorable online marketing tool. 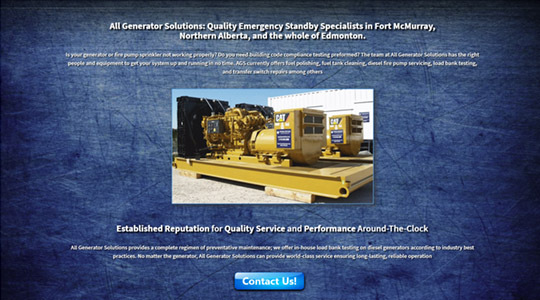 While many websites lean on relatively bland, albeit clean and easy to navigate visual layout, clients like All Generator Solutions use the opportunity for graphic design to entertain the eye and impress upon the audience the brand identity, using design to match the business itself; modern and forward-thinking. If your interested in some professional graphic design services for your next website design project, please contact us any time.